Advocate Cat Fleas, Heartworm, Worms Treatment provide convenient, continuous and also broad protection against numerous parasites threatening well-being, health and, in some cases, even the life of pets. Moreover, Advocate is a so-called endectocide, a single product effective against both, ecto- and endoparasites, like fleas, lice, mites and different types of worms. Furthermore, Advocate for Cats is a monthly spot-on type medication for the prevention of heartworm, and the treatment of fleas, hookworm, roundworm, and ear mites in cats. As a result, Advocate is the closest thing to a vaccine against Australia’s most common parasites. 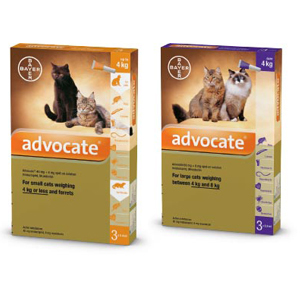 Place the applicator tip of the Advocate for Cats through the cats hair to the skin level. For cats, apply to the skin on the back of the neck at the base of the skull. Do not get any Advocate for Cats flea and worm medication in the pet’s eyes or mouth. Products listed as backorder will be ready for collection/delivery between 2-7 business days depending on availability. You will be notified of the progress of your order, if you have any questions we are happy to help.